Th project selector display only the name of the project. But in my case, i have more than 60 current projects and i would like to distinguish them by customer for example. Is it possible to display an additional information such as customer as a prefix, or something else? On the list of all projects you can use the icon "filter" to get a new list filtered by customer. Dynamic option filter allow you to choose which customer(s) you select each time you will use this filter. 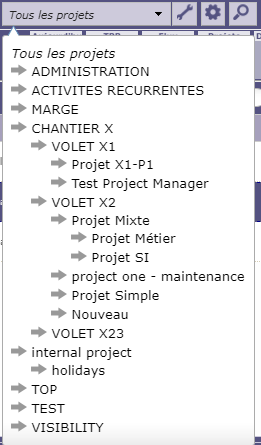 On right side of project selector, you have a magnifyer to search for projects. You get the project list (like on project screen) where you can search on customer. Is it possible to get project selector look like the attach file? To have a hierarchy by customer ? Well it already does, if you sdelect the "stadard format"
Now, the "Customer" level is not generated automatically.